This project was created on 05/13/2015 and last updated 5 months ago. A 6502 homebrew microcomputer, fully featured with sound, video, I/O and a self-developed built in programming language. The machine is fully self sufficient with on-board mass storage - just switch on and start programming it, like the heyday of UK micros in the early 1980s. Programming: dflat - a structured BASIC interpreter with support for video and sound. I&apos;ll copy the notes from my schematic by way of an explanation.. This is solved through 3 solution approaches as follows.. I also have a 5.36Mhz clock available, but in previous attempts at trying this, I end up with a blank screen an/or frozen machine. This led me to believe that my RAM was not fast enough to keep up with the demand at 5.36Mhz. So I tried swapping out the 70ns RAM chip with a very fast 15ns RAM chip. I also made some software adjustments, mainly putting in extra NOP instructions to delay the speed at which the TMS9918 was being driven and the BBC keyboard was being strobed. To cut a long story short, it turns out that the 15ns chip is glitchy, but the 70ns chip works fine once the software reflects the faster CPU cycles. 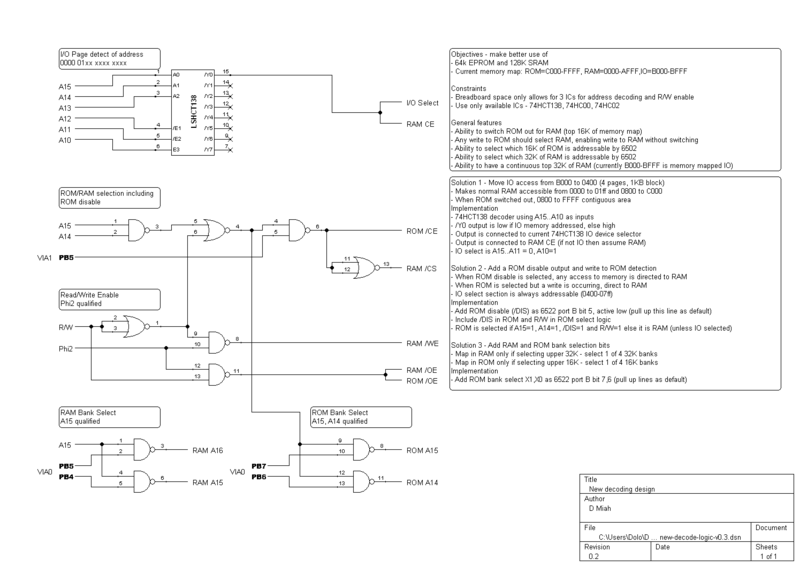 I also got a huge amount of insight from the expert folks over at the 6502 forum - turns out my assumptions on the activities of the 6502 across one clock cycle are incorrect, but still my current design does work without any issues - but it&apos;s not optimal and I will sort this out in due course. New decode logic for 128K RAM and 64K ROM. Note the source files are still for the original decode logic, will replace that in due course. Decode logic is where the magic happens - it implements the memory map by selecting the appropriate chips when the CPU puts a particular address on the bus (the 6502 is purely memory mapped). Tetris program file as an example of a fairly large dflat app. This program uses sound, graphics and sprites, plus string and numeric array handling. So it shows off a number of the key features. To open this, just use notepad++ or similar. The TMS9918 pin out is configured for DRAM, which is hard to come by and use these days. Tom LeMense gave me permission to add this to my project archive. Many thanks to Tom for his work and generosity. 1 × W27c512 EEPROM EEPROM - anachronistic for an 80s computer, but essential for productivity! I have decided to start a new log dedicated to dflat, the programming language I have built. I&apos;ll tidy up the other logs for duplication, but here will be detailed information and demos to show the capabilities. I had an initial video of a demo space invaders type game on youtube but decided to replace it with something more extensive and some commentary which I hope helps. This is basically a complete game, takes up around 6500 bytes of source code (which is tokenised to around 4500 bytes in memory). It&apos;s extremely rudimentary, but about the quality of type in games found in magazines of the early 80s, so I&apos;m not too embarrassed by the effort. During the programming of this game, I had some strange things occur which I traced back to a couple of serious bugs in dflat around the saving of state when calling a procedure - luckily not too difficult to fix. I am still impressed with the speed of dflat. My old Oric-1 would have struggled..
Ok, so this part is not so much a blog, but a place to throw up the storyboard of my project through photos I have been taking from the beginning to present. So I started very basic. I don&apos;t have pics of the 6502 in a free run set up, but the following images give a flavour of just how bare-bones it all started.. Clock and reset circuit, amongst the first thing I built and can be seen in the current set up. What&apos;s that tiny vero board on the right with a screw sticking out of it? Well it is my original power supply - stepping down from 9V to 5V. That screw is a heat sink! Initial decoding logic - don&apos;t even ask me what I was thinking! This has definitely not made it through to the current set up, in fact I never got to using it as realised it had impractical (or at the least worrying) levels of delay due to the number of cascading chips I was using. When I got hold of a TMS9918, I tried to work out if it was alive with a little free-run circuit. All it proves is that the TMS is getting power and a valid 10.738Mhz clock signal, so not really that useful with hindsight.. This next pic looks like quite a jump, and in a sense it was - the main layout is taking shape. I decided to try and organise a central address and databus section around which I could wire up the necessary ICs. This board only has some ROM wired up but with an oscilloscope snooping the CPU address bus, I could verify that a programe was running and therefore, it lives! As can be seen, I am using a Winbond 27E512 (later on I stuck with a 27C512, but same wiring). Talking about oscilloscopes, I thought I shoud put up the core tools I used (and still do). First the oscilloscope. I had a 2Mhz bandwidth handheld puppy, but it was inadequate so invested in a USB connected one with dual channels. Without this I definitely would not have got the board running with all the components I have today. Next, I have a EEPROM programmer. I did try to go down the authentic route and got myself some EPROMS, programmer and UV eraser! The edit/program/test/erase cycle was depressing so quickly moved on to the BATUPO - I tried some cheap far-East programmers (Top-Win anyone?) but this was and is way more reliable. This is now the most used tool of course as it&apos;s all about the software.. The other thing I needed was a TV capture device. For a while this worked fine, but the delay on this is horrible, so now am using a regular LCD TV (as I have space in the office because we moved to a larger place in Summer 2015). Still, the TV Out was useful initially when office and desk space was at a premium. I ran out of USB ports - Programme, Scope, TV Capture. And that didn&apos;t leave room for a serial port! So I needed a USB hub. My initial board was serial only using the 6526 (from a non-function CBM64) to bit-bang the serial line. I managed to get 9600bps reliably, before deciding to do things more properly and implement a 6551 ACIA. The board in this pic has ROM, RAM, 6502, 6526 all working well, with serial I/O the only means of communication. Even so, there is quite a lot of breadboard building up here, and it is starting to get awkward / delicate in moving it. I sent the following picture to my friend (sadly he passed away too young) when I was explaining the basics of what I had got going. The breadboards are now stuck to a plastic chopping board to keep them together! This is very much the current set up, but with sound added and the IO chips are actually 6522 VIAs rather than 6526 PIAs. The original clock and reset circuit is bottom left. More recent pics to follow..
I&apos;ve added a token table which describes all the tokens that dflat understands - basically this is the list of statements, commands, functions and operators. Line numbers only used by the editor to store program lines in a sequence - no dflat commands directly refer to the line numbers. User defined procedures with parameters which can be made local. This is heavily inspired by the way BBC Basic did things. Simplified variable naming: Every variable has a prefixed type qualifier (e.g. %a is an integer variable). The opportunity with this is to perform easier syntax checking and runtime execution, which it does - sort of. Execution can start at any procedure invoked from the command line - my own convention is to use "_start()"
I thought perhaps I should just dump the keywords, functions and operators that dflat supports. Anyone with a memory of BBC, Atari or Oric BASIC will know most of these commands. if, else, elseif, endif : execute a section of code if a condition is true, else execute another section, else execution another section if another condition is true. Control passes to the next statement after endif. stick(x) : read joystick, and with mask x (to allow only a certain signal to be tested for). The joystick signals are active 0 as follows : bit 7 = fire, bit 6 = left, bit 5 = right, bit 4 = up, bit 3 = down. play te, ne, env, per: set up the tone and envelope configuration. te = 3 bit number for tone enable, ne = 3 bit number for noise mix with each tone channel, env = 4 bit envelope setting, per = 16 bit period. I have been tinkering with the SD card low level routines. It was bugging me that when I wired up the SD card pins, the MISO line was attached to pin 2 Port B of one of my VIAs. MISO stands for Master In Slave Out - i.e. the output from the card, which needs sampling bit by bit to retrieve data serially. In addition the output from my machine to the card (MOSI - Master Out Slave In) was coded rather hamfistedly. So I resolved to eliminate this worm in my brain this morning. I swapped the MISO line to pin 7 and moved the CLK line to pin 7. So what? Well know when I read the Port B register, I don&apos;t need to do a bit test for the MISO state - the N bit of the 6502 will be automatically set. So I can use this feature to optimise the code. Here is the new code to get a byte. The inner loop which is called for each bit is a maximum of 29 clock cycles. The previous code (see further down in this log) is a maximum of 37 clock cycles. So 8 clock cycles per bit doesn&apos;t sound like much but this routine is used constantly when reading or writing from the SD Card. The clever bit is the CMP - this is used to do a test subtraction which will set or clear the carry flag which can be used to directly shift in the correct bit without cumberson bitwise tests or operations. Here is the new code to send a byte. The inner loop here is 33 clock cycles, the previous code (see old entry further down) is 38 clock cycles. Only 5 clocks per bit - but 8 bits per byte, so 40 clocks saved per byte to send. Sending 10,000 byte saves 400,000 clock cycles which @ 2.68Mhz is 0.15 seconds saved. Open : Equivalent of the MSDOS &apos;Type&apos; command - outputs a file to the screen / terminal. I&apos;ve tested this with 200KB+ files, which shows that the software is correctly iterating through multiple SD card sectors as well as FAT16 clusters. For my homebrew to have a reasonably complete set of features, I really want some sound output capability. For the retro and nostalgic feel, I chose the AY-3-8910. This is a common sound part from the 80s, and was the sound chip in my very first computer, the Oric-1. It was also used in MSX and some other 80s devices (even in PC sound cards and arcade machines iirc). Wiring up an 8910 is fairly straightforward, however it cannot be driven directly off the 6502 address and data bus. The reason is that the 8910 has some bus control lines which are more compatible with the processor family that General Instrument (makers of this part) also used to produce. So this is a lot of writes just to set a register in the 8910. And several registers need to be set to be able to make a sound! But I have tiny sense of personal achievement that I&apos;m understanding the challenges that the engineers at Tangerine had when they designed the Oric-1 (similar solution). One useful thing the 8910 does have 16 I/O ports, so that kind of makes up for having to use the 6522 ports to drive it - although getting data in and out of these ports is slow. However, these I/O lines will be good for human interface devices as they are much slower than serial or video access. Hence, I am using the port for the 80&apos;s Atari compatible joysticks. These need 5 lines (4 directions plus fire button), so I could add more than one joystick (might be useful). For the moment I have stuck with 1 joystick only. The built in language I have devised (dflat) support VDP capabilities directly such as changing colours, manipulating sprites and setting text vs graphics mode. However it doesn&apos;t have any high resolution support and that was ok when I was using the TMS9918, but now that have the TMS9918a variant which supports 256x192 bit map graphics, I thought about how I can access this. With ROM space tight, I realised that actually I have the ability to do low level access through the commands &apos;setvdp&apos;, &apos;vpoke&apos; and &apos;vpeek&apos; - these access the VDP registers, write to VRAM and read from VRAM respectively. Update end-March 2016 : short anecdote.. I had a little disaster with the video hardware, although it&apos;s ended (sort of ok). The hardware has been working very well for a while so I have been focussing on system and programming language software. However the last time I sat down to do some work, the video output seemed to be going haywire. I won&apos;t go through the whole story, but the root cause turned out to be my ground (!) line had broken loose from my USB header. The computer would only fire up if connected to the TV (presumably it was using the TV ground), but the video was messed up. Initially I started prodding about the VDP as breadboard connections can come loose. I pulled the VDP out once or twice in the process of troubleshooting, which is when the disaster occurred - one of the IC legs (pin 20) broke off after one too many insertions and removals. I have a TMS9928 but that doesn&apos;t give me composite colour out and I really didn&apos;t want to make up a new lead (yet). So I had to carefully solder a fly lead from the just visible connection on the IC for pin 20. See below - amazed that it worked. I think the days of this VDP are numbered and I will start making preparations to install the 9928a. The main difference is that the &apos;28 supports RGB output - but also I am not using the &apos;a&apos; variant of the 9918 so I will also have access to a full bit-mapped graphics mode. Self generated as per ZX80! The 6845 and 47 to me seemed daunting as my knowledge of digital hardware is so basic, so I discounted those. I did a fair bit of research in to self generated video - partly inspired by Quinn Dunki&apos;s attempt using an AVR. However I didn&apos;t have an AVR so was going to use a second W65c02s running at 8MHz - I calculated that I could just about generate a 176 pixel monochrome display if I was very careful with instruction cycle counting. However, I was not sure about the ability to generate the synchronisation signals as this would need something like a 6522 or 6526 and they may not be able to keep up with the display processor. Anyway, to cut a long story short, I decided this option had too many unknowns and I could end up spending a lot of time building something which would not work or ever be expandable. In my search I did keep going back to the TMS99xx series of Video Display Processors. These were commonly found in the TI99-4/A and MSX range of micros in the 80s, although Colecovision and other consoles also used it IIRC. One of the key methods of input and output with my home brew is serial communications to and from my development machine (a modern Windows 10 laptop). The serial commmunication protocols I remember from in the 80s and early 90s was RS-232. I naively thought this would be the thing to use now. However, my development machine does not have serial ports - USB is now the only serial methods I have at my disposal. A bit of research revealed that direct USB to homebrew connectivity would be difficult (at least for me) to achieve. However, the popularity of kit like Arduino and Raspberry Pi have helped the proliferation of USB to serial cables with built in adapters. I purchased a very cheap one off ebay. It means that when connected to my dev machine, an additional COM port in Windows is available, through which I can use a terminal emulator. On the homebrew side, the cable presents 4 pins : +5V, GND, Serial Out, Serial In. This means I also have the ability to power my homebrew off the 5V supply rather than using my home-made 5V supply (interesting mini-project, but clunky). My original serial comms was designed around using the SP pin on each of the two CIAs for input and output. However, it required a fairly software intensive set up to drive and I wasn&apos;t happy with the reliability of it. Plus, I wanted to use the CIA lines for other expansion options. So I added a CMD 65c51 ACIA. This is a fairly simple to operate serial input/output device, and being part of the MOS family, easy to interface to the 6502. I will keep the rest of this section for historic purposes. The software programming of the CIA was simple and it was easy to update the few low level I/O routines. However, it still took me ages to get it working because the ACIA needs a 1.8432Mhz clock. As this is not a muliple of my 21.7MHz, it needed it&apos;s own clock circuit. So I obtained an appropriate crystal and wired up a 7404 using a circuit diagram off the internet. I checked it with the scope and it looked like the circuit was putting out a clean 1.8432MHz square wave. However the ACIA was not working, no matter what I did. I then noticed some unusual behaviour - for example if my finger touched the crystal, suddenly the ACIA would work and continue to work. Even putting my hand near the ACIA seemed to kick it in to life - very, very weird. I put it down to the clock generator circuit. I have not spent any time trying to understand the most analogue part of the home brew which is the clock generators using piezo effects generated by crystals. So I had no idea what to do, but after further searching found an alternative circuit which starts up without requiring the touch of a finger or a magic wave of the hand!! The two 6526 CIAs in the system provide serial communications. Even though each CIA has a SP pin for serial input or output, the USB to serial adapter I am using has a dedicated pins for send and receive. I wasn&apos;t sure how to wire up a single SP to two pins on the serial interface, so I decided to use one 6525 for input and the other for output. Connect the /FLAG pin to the Serial input line. This means I an configure an interrupt to occur if the serial line goes low. The default state of the serial input line is high, with a zero start-bit indicating the start of a transfer. more than one byte can be written. the dump for another 8 byte block, any other key stops the dump. key is pressed. More than one address can be watched. SECTOR <addr> Load sector <addr> in to memory. Useful for low level inspection of SD cards. In terms of hardware design, I realised that there are not really that many parameters one can play with when using off the shelf components. The point is that things like the 6502, 6526, 6522, 9918 etc. are by design expecting certain inputs and outputs, so they set out some fundamental design constaints. The general input, output and interfacing capabilities provided by the 6522s (two of them) and the memory map design are the two most significant areas for creativity. For the old memory map, see that heading. The way I have done this is to take spare lines from the two 6522s I have, one will be ROM disable, two will be to select the RAM bank and the other two to select the ROM bank. The actual decode logic is in the downloads. I now have plenty of opportunity to expand my project, especially so with the additional ROM space. It will take a little thinking through but once implemented, I will have loads of available ROM to fill - should keep me busy with the project for a many more months! The memory map was one of the first and most interesting areas of investigation. The 6502 has a 64KB address range - so all my RAM, ROM and memory-mapped devices need to fit in to that. Being old-school, I wanted to try and put together a map which maximised RAM without overly compromising ROM and memory-mapped device access. So this gives 32KB RAM, 16KB ROM and 16KB devices space. I had a board working with this configuration, but it was just to allow me to prove I had wired things up. I went for an addressing scheme which would give me 44KB RAM, 4KB devices (8 512 byte IO blocks) and 16KB ROM. It was fun coming up with the decoding logic for this and then working out how to implement this using some NAND and NOT gates. Although this is an on-going project, I have been working on it for over a year before publishing anything, so I&apos;ll try and capture some of my approach, experiences and lessons learnt to bring this site up to date. One thing I have been doing over the life of this project is trying to do it on a shoe-string budget. That&apos;s just the way I am - a bit of a tight-arse who likes to think he&apos;s got a bargain of some sort! However whilst being budget conscious is great in nearly any setting, it has to be with some level of pragmatic trade off and risking the saying of &apos;buy cheap, buy twice&apos; coming in to effect. So I learned by trial and error the right budget trade off! I don&apos;t know how much I have spent on this hobby, but I am sure it has to be approaching £250-300 by now. I started off with literally nothing - no components, no tools, no experience. But I did a lot of reading. The internet is fantastic, so many people willing to put their experience and knowledge out there on the web for the rest of us to benefit from. I can&apos;t possibly remember or list every resource I have examined, but over the course of this project www.6502.org has been a fantastic well of knowledge. Initially I needed to get some kit together. I bought a bunch of basic components (resistors, capacitors, transistors, 555 timers, crytals, LEDs etc.) with some wire (solid core, multi-colour). I also decide to use breadboards to try out my experiments (as they were right at the beginning). I love breadboards, but I&apos;ll mention some of the problems I have with them later, they&apos;re not all good! It had to have video graphics output. I had homebrews which used small LCD panels or no video at all - this wouldn&apos;t for me as I wanted to be able to play video games on it! It had to have sound output output. Again, I had seen homebrews which didn&apos;t care much about sound, but I wanted this. So, I had some basic electronic components, but no complex ICs like a CPU, memory etc. Looking through a number of existing homebrew sites, I could see a variety of CPUs had been used including 6809, 8080, 68000. However fascinating these other projects were, I had already resolved to use the 6502 at the heart of my project. The reason is straightforward nostalgia. My first computer was a 6502 based micro called the Oric-1, bought for £80 in a knock down sale in 1984. I was 13, and knew nothing about computing, but convinced my hard-up parents that I needed one, and this was in the right price bracket (i.e. really, really cheap). But this computer took me from never having written a BASIC program to being able to code assembly in hex (because I couldn&apos;t afford an assembler - eventually wrote one for myself). When I grew out of the Oric-1, I got an Atari 800XL in 1985, which was also 6502 based. Aside from nostalgia, I could see that with everything else I was going to have to learn to be able to build my own computer, having something I was already familiar with would be a good thing. Awesome project! I&apos;ve started to build a homebrew computer about 3 or 4 times but I always get distracted by other projects... I need to just sit down and finish one! Cheers. Thanks for your kind comment! What I did was to start simple then add capabilities. So initially just the bare machine with just serial IO, then added video, sound, SD card and real keyboard over a few months. It&apos;s a hobby for me so doesn&apos;t really ever gets finished! Thanks for reply Dolo. I hope to make a start on this project when things are a bit cooler (I too am in UK!) and look forward to more details in due course. I will also look into sourcing the parts which hopefully are still available. I cant contribute to this topic because im almost level one hacker but your work fells much satisfying,bravo! I mean the hackerday.io was a link found revelation for me and still i fell bad because ill never have a knowledge to do something like you guys do here. It is soo advanced and the projects are the real eye catcher. Any updated Source for dflat? Hey there, have had a busy week at work hence the delay, but thanks for your interest. I will upload updated source soon after a couple more tweaks. It is greatly enhanced since that time for example supporting functions, recursion, better order of precedence, high resolution commands, some small performance optimisations. Are you looking to use dflat in a project or for learning purposes? Most of dflat is fairly machine independent, but when it comes to things like graphics, sound and keyboard then of course it is quite specific. If it is for a combination of using and learning, then let me tidy things up a bit in terms of comments - I haven&apos;t followed my own advice on comments and it can be hard to follow in some places. Wow, you have built your own CPU - cool! So you will need to translate the 65c02 assembly to your machine language? This will be very interesting depending on the differences between your CPU and the 65c02 (e.g. number of registers, addressing modes, variety of instructions). Due to the comparative lack of registers (say compared to a Z80), the 65c02 isn&apos;t very code dense - meaning it can take more instructions than on a CPU with more complex instructions. The core of dflat, without the machine specific stuff like I/O and graphics should run on any 65c02 without much modification - subject of course to setting up the zero page variables and required storage for language specific stacks etc. The specific stuff for graphics, sound and I/O are generally coded in separate files - but at some point a dflat command e.g. &apos;sprite&apos; does need to call hardware specific routines. how much time it took you to make? Hi George - sorry for more than a year to reply to this comment, but if it doesn&apos;t help you perhaps it will help others! The main activities were the initial learning and research, then building up the hardware, and then building out the software. By far the longest time is has been the software. I started this project sometime in late 2014 - so now it has been 3 years elapsed. However this is a hobby, so not full time of course. Sometimes only a couple of hours a week and sometimes much more. I would guess that in the 150 weeks I have spent probably an average of 2 hours per week is fair. So 300 hours! The software has got to be around 200 hours of this as I built an entire programming language from scratch. If this was a full time job, I could have completed in only 8-9 months. But it has been very enjoyable. Hi and thanks for the skull. I&apos;ve been distracted with other things for a few days so not been on here for a while. I don&apos;t have schematics as such but I have kept a document with details of all the components and connections, will tidy it up a bit and put on here at the next opportunity. That would be great. My main interest is to see how you write the driver for the TMS9918 (VDP) chip. I found on the net there is a schematic of interfacing the TMS9918 with a 32KB SRAM chip. Thanks. Hope that helps - there should be enough in there for you to connect up a 9918 to SRAM and get decoding and bus wiring to drive it with a 6502 (assuming that&apos;s the CPU you&apos;re using). Most Video Chips back in the eighties were quite bad, the 6847 being pretty dreadful even by the 1980s standard., using a TMS9918 for Video ?? perhaps the V99x8 for video or even a V9990 might make more sense and still givie a very 80s Retro Feel ! Hey lezanderson. Thanks for your comments. I think I may have bought some kits from you from ebay? So they have made it in my computer - the RAM and ROM are from those kits I bought! So I&apos;m using the TMS9918. I will write a simple game to show it all off and with sound soon. Still writing the OS components at the moment. Sounds even More Awesome !! If you need any help sourcing ICs let me know ! I am trying to replace the 6526 PIAs with faster 6522 VIAs. The main control lines (Clock, R/W, /CS, /RES) are in the same place. The only other difference is that the 6522 has another Chip Select active high - this is just tied to +5V. So using my monitor programme to inspect memory, I can read the 6526 register file, but the 6522 returns the high byte of the address bus? This makes no sense to me - literally have a 6526 and a 6522 plugged in at the same time - the 6526 seems to be responding, the 6522 just returns this weird data. What am I doing wrong - any ideas? 6581R4, 6582, 8580R5 I have heard this is next to impossible with the older MOS chip manufacturing is extremely expensive, but how could I go about this with FPGA? What all chip programmers would be needed etc. BTW im new to FPGA. Commdore brand of REU&apos;s (memory expander cartridges) 1750, 1764 etc. MOS 1351 Mouse controller IC, keep in mind this somehow worked in conjunction somehow with the SID oscillator or the X or Y something in the SID? SID chips would cost a Million dollars, yikes. the 1351 is very rare these days. for C=64 and C=128 chips. I would be open to any help or suggestions or any open source for FPGA? 1) These chips have analog filers. I was going to use single bit digital conversion for this but that is a complex solution. 2) The original spec that you will find on the net was different to what was actually manufactured. 3) The manufacture then changed to a different spec that is unknown. 4) There were bugs in the design and some programmers utilised the effects of these bugs so they now have to be included in any new design. We have Bil Herd ( bherd )here on HAD and he was on the original design team for the C64 and some other machines. You may ask him for some guidance. I was going to give the SID a go but I need some specs or better still - an actual real SID chip (not some junk from China) to map out a specification for it. My plan of attack was to use single bit D to A conversion to drive an external capacitor and then use LVDS to detect the analog result and then back to single bit conversion for the rest of the digital stages. This would save a lot of complex external analog components but emulating analog circuits in a digital system is not the easiest of tasks. can only imitate MOS. Can you use PLD I think Bil mentioned its the best for MOS. My only other problem is getting certain tools etc What would I need? confusing. Maybe I can ask Bil how. I don&apos;t have a C64 or any of the parts. My retro computer is an Amstrad CPC6128 and I have a project to clone a TRS-80. The mouse controller should be simple as it&apos;s all digital. Most of the stuff for the C64 that *can easily* be done in FPGA, is probably out there already. The SID chips are different. FPGA contains ONLY logic circuits but the SID chips had both logic and analog circuits. So to work in FPGA you need to emulate an analog circuit with logic. Most people today would find this very hard to do because you need a very sound understanding (including complex math) of how analog works. Older people like me understand analog well because that is where we started. So writing a (state driven) parallel processing DSP in VHDL is do-able. Unfortunately knowing how to make it is of no use without knowing what it *is* and that is the first challenge. There is no &apos;correct&apos; specification for the SID that I can find so it would have to be reverse engineered. lol and that creates the next challenge - making the mixed analog / digital equipment to reverse engineer the chips signal. I have the experience and knowledge to do this but it&apos;s still a big effort and I am not really a fan of the SID. I did (a browser session of) research the history. Bil Herd has been asked about the SID many times and he has given short answers as you would expect as a response to a relatively simple question. I personally don&apos;t think Bil has access to the specification that went off to the manufacturer as that was more the area for the technicians and not the engineers like Bil. I did find an interview with the designer of the SID and from that I learnt why there is so much mystery. He made a last minute change to the specification just prior to it going off to the manufacturers. I think the mod was to phase synchronise the sound channels. So while I have some of the &apos;missing skills&apos; to make a modern SID a reality - I can&apos;t take it on alone. I already have a number of projects on the go and due to my current health there is no guarantee that I will complete any of them. Of course the whole SID doesn&apos;t have to be exclusively done in FPGA. You could use external analog filters or even go with a mixed signal System on a Chip (SoC) like the Cypress 4100 / 4200 SoC&apos;s that have a inbuilt processor (M0). As for learning VHDL - well I recently started in VHDL so I am no expert but I do know the process to get going and I will write a page about that (if I find time) and put it on my profile - and link to it here. Oh - I am in Australia living with the spiders ,crocodiles, sharks, snakes and all manner of things that kill lol. The imitation SID (fake) from China is a digital only chip with no filters so it sounds like sh!t lol. Here is a you tube and if you read the comments you will find that even the emulators can&apos;t &apos;emulate&apos; the filters on the SID. The video shows just how good some people are at using the genuine SID with filters. PS: Skip to about half way in the video for the good stuff. PPS: Most of this rant is about the filters. You will already find VHDL out there to emulate the SID but that is without the analog filters. I also saw a replacement done with a micro-controller (virtual peripheral) but it didn&apos;t support filters at least at that stage - perhaps I should go a check up. Hi. Your plans are incredible, although I really don&apos;t know much about FPGA or indeed the micro-hardware level description of CBM chips. But I see that Howard Jones has made a reply. Good luck with your endeavour, look forward to seeing it fly sometime! Ah, yes I have seen the F18A project as part of my research a year or two ago. It&apos;s very clever indeed, but agree it&apos;s too expensive. One of my goals was trying to use old parts and cheap components - not necessarily representative of the age (SRAM was not commonplace in the early 80s, and neither really was CMOS). I don&apos;t know much about CPLD, I must look in to it at some point. However, I did make some investigations in to using a second 65c02 running at 8Mhz to do video - it&apos;s tight but I think a basic 176 pixel wide display could have been achievable (monochrome though). I have a multi-input TV and even though it&apos;s second-hand and fairly old, it has PC and TV inputs. Good luck with the TRS-80 and Z80 machines you&apos;re building - keep at it! I am wondering if that 9918 will run fast enough for a VGA output. I am making a retro computer as well (taking forever) but for the one I am making I decided to only use currently available chips so Video is the hardest part and I am doing it on CPLD with VHDL. That is not a solution in itself as I do really need some &apos;standard&apos; for the Video interface. So I wondering how good is the interface that is presented by the 9918. Maybe I could see if it has been duplicated in HDL. The 6845 is actually a bit easier to use but not as good as the 9918 but in any case as you wanted to separate the (S)RAM so the obvious choice is a 9918. Hi - lol, yes great alternative name for BBC!! I don&apos;t think the 9918 will be fast enough for VGA - the 9918 outputs a line frequency around 15KHz, IIRC VGA is more like 31.5KHz. The master clock for the 9918 is already at 21.477Mhz, which seems really high for a 1970&apos;s part already, not convinced it has the bandwidth to go double. Yes video is really hard as modern components have so many pins and run so fast - so it wasn&apos;t an option for me using breadboard. The 9918 interface is really straightforward. Essentially there is just an 8 bit CPU interface, a mode indicator, and then the read/write lines (two lines one for read, one for write!). The mode is really just tied to A0 of the 6502, and the read and write lines are decoded appropriately from the 6503 R/W line. There is another programmers manual that can be found if you search which is more software orientated, although the above manual does cover software programming to an extent. I had a look around for a FPGA implementation of the 9918 and found a couple. so it&apos;s more or less bread board friendly. Unfortunately the chosen FPGA is over kill and expensive. The same/similar chip is used for the GameDuino (first version) and that is probably a lot better and has more sprites etc but the GameDuino is SPI interface. Perhaps I should see if the GameDuino is open source and convert it to parallel interface. I am still looking as I haven&apos;t seen actual VHDL and I want to know what the smallest chip it will fit in (hopefully just a larger CPLD) along with external SRAM. Agreed, one the hardest aspects of this sort of prototyping is dealing with non-breadboard friendly parts. I have been using adaptors and breakouts and now I am moving to wire wrap. I love how it's now inside a regular computer-case, but is a bunch of solderless-breadboards inside! I needed a case to keep all those breadboards and dodgy wiring safe! Yeah I like that I used a case of a computer that I coveted in the early 80s. The BBC micro was a premium machine of the time in the UK. New pictures of homebrew in the BBC case. With the case closed of course it looks like a BBC. But, my homebrew is faster (2.68MHz vs 2MHz) and has more memory (44KB RAM, 16KB VRAM, 16KB ROM)! So better than a BBC? No of course not - BBC hardware and engineering was pretty amazing, loads of respect to the Acorn guys in Cambridge. Still, pleased with the hardware - but there are many miles left in my journey. I will focus more on software for a while, although I think I really do need to add some kind of mass storage (I think SD card). Reaching a kind of milestone... I am in the process of gutting out the internal bits of the BBC Micro case (I need to cut away the plastic dividers between where the PSU and main board are located). Can't believe how thick the plastic is - this beast was seriously engineered, no wonder I could never afford one. Anyway, even after modding the case, I have realised that the configuration of the breadboards of my homebrew mean I can't just drop it in. So now I have to move the sound and acia mini-breadboards. Sounds simple, but I stuck them all down on a plastic chopping board!!! I sometimes out-do myself when it comes to kludges, but at the time without a case I needed a firm base for the circuits. So, I will have to unstick the small breadboards and move them around. This means all the connections will have to be re-done as they will have to be different lengths - and I'm running out of wire! I'm quite excited - I bought a non-working BBC Micro off ebay. I want to reuse the keyboard and case (the BBC case is sizeable - should be able to take my bread-board contraption with ease!). I hooked up the keyboard and checked it out with the oscilloscope and it seems to work fine (the '7' key is a bit temperamental though). As an aside, the BBC keyboard is a brilliant design with a combination of hardware interrupt and software polling to read keys. Great engineering, I now see why the BBC cost £400 when I was a kid - way, way out of my price league!! Hi. Yes, I do have a lot to do - even to bring this project up to date with everything I've done so far. At the moment, I am kind of brain-dumping (I have already added a few logs) - but any suggestions for which areas would be of interest to cover would be helpful. Thanks the encouragement, and your question is not dumb at all ! At the moment there is no O/S - literally boots up, clears RAM and VRAM then jumps in to the monitor program. All the low level I/O has just been hacked together - no elegance or consistency. I did this just to make sure all the bits were working. I want to learn from the ground up - so no porting, although will look at other O/S features and techniques. I will keep it *really* simple though - just make some baby steps that I can build on! You are about to report the project "6502 Homebrew Computer", please tell us the reason.